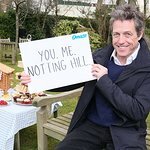 Hugh Grant has launched Marie Curie Cancer Care's Great Daffodil Appeal calling on people all over the UK to make a donation and wear a daffodil pin – the charity’s emblem – throughout March. Hugh has supported the charity as a fundraiser and ambassador since his mother died at home in 2001, cared for by Marie Curie Nurses. The actor has made a short film to promote the appeal. The film features Marie Curie Nurse Lorna McGarry and charity fundraiser Maria Gleeson.